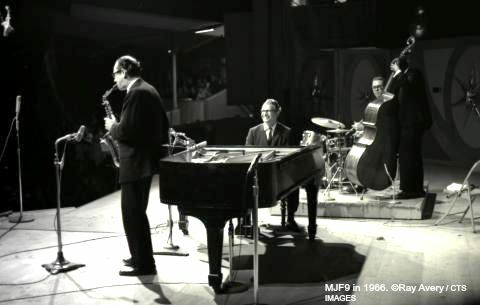 How many times did the Dave Brubeck Quartet perform “Take Five?” Hundreds? Maybe thousands. No one other than Brubeck, Paul Desmond, Eugene Wright and Joe Morello would know for certain, and it’s unlikely that any of them kept a scorecard. “Take Five” is the annuity that keeps on giving to the American Red Cross, Desmond’s legatee. Noel Silverman, the executor of Desmond’s estate, informed me this morning that royalties, mostly from “Take Five,” have given the Red Cross upwards of 7 million dollars since Desmond’s death in 1977. In listening to the quartet in person and on record and in doing research for my Desmond biography, I have heard dozens of their performances of his most enduring composition. Still, I had never heard a Desmond “Take Five” solo as unpredictable as the one he played at the Monterey Jazz Festival in 1966. Not wanting to be a repeater pencil—to borrow Lester Young’s phrase—Paul varied his “Take Five” solos to prevent boredom, to entertain himself, the band and the audience, or to get a laugh out of Brubeck. For thirty years or so, surprising Brubeck gave Desmond enormous satisfaction. In this audio clip from the MJF website, we can’t see Dave’s reaction, but it’s easy to imagine it. For an illustrated collection of information about Brubeck’s and the quartet’s long history with the Monterey festival, see the MJF website. About 25 years ago, for her “finals” project to complete her Performing Arts degree, My daughter opted to decline use of the university’s state-of-the-art theatre and instead produce her show in the cafeteria, where about 100 performers sat at dining tables and progressively built a choreographed “Flash Mob” performance while a jazz trio played “Take Five”. The watching examiners and the audience rated it the top performance, awarding the highest degree to a dancer EVER. That led to a 25-year career producing shows and training dancers including Prince Harry—Eton College’s ‘Captain of Dance’—with Harry leading a dance troupe through Gil Evans’s “Sketches of Spain,” accompanied by the Eton College Orchestra. Desmond must have inspired hundreds of careers he could never have imagined. Paul Desmond was a close friend of my ex-husband, Jack Shore. Jack told me that Paul had left his piano to Phyllis Diller, who was an accomplished piano player. That surprised me because I knew that his sense of humor was very dry. Phyllis Diller’s humor was anything but dry – silly and self-deprecating. The Baldwin concert grand piano went to Bradley Cunningham, who installed it in his club. After Bradley’s closed, his widow Wendy put the piano on permanent loan to the Jazz Gallery, a nonprofit jazz club in lower Manhattan. To the best of my knowledge, the Baldwin is still at the Jazz Gallery. I wonder whether it is only here in Russia that quite a lot of the videos posted in the blog have been unavailable lately. Especially I am upset by the situation with this audio clip as I am a great fan of Paul Desmond and is always eager to hear something new connected with his music. What a pity!!!. Are Rifftides readers in countries other than Russia having the same problem? No, it’s not just Russia; I’m in Sweden and can’t see the clip either. I often experience this problem with music videos uploaded to YouTube from the US. One of those arcane copyright issues? I’ve played in groups where the request for “Take Five” could be answered with all of the enthusiasm of responding to a request for “Freebird.” Ironically, the pendulum has swung back to where I suspect it’s underplayed (“Take Five,” not “Freebird”). I miss playing it just because someone else got tired of it at some point.